I post these two letters so others may glimpse what I and my family went through from 1978, when I found my grandfathers 1903 D&C and from its pages read for the first time ever the Lectures on Faith, to 1982 when Mr. Featherstone wrote and challenged us with his various arguments for not turning our backs on Mormonism. Deon and I thank you for your letter of June 30. That you would take time from your busy schedule to dictate a letter and include under separate cover a copy of your book, “Charity Never Faileth,” is most sincerely appreciated.Your concern for our decision to part company with the LDS church was prompted apparently by information from a third party. We recognize that the concern you express, reflecting that of your informant, is genuine and prompted by what you view as the highest of motives. We pray that our response to your letter may be received in the same spirit, and may convey to you some sense of our increased insight into the church we grew up in, the church we find we must now separate ourselves from. We invite your careful and prayerful consideration of our response and look forward to further dialogue if such should be your desire. Our decision to leave the LDS church was not lightly arrived at I assure you. Your information seems to have it that our present argument with Mormon doctrine and practice somehow centers on the Lectures on Faith. Such is not the case. While it is true that in early 1978 our introduction to the conflicts found in an in-depth study of Mormonism was by way of the discovery of my grandfather’s 1903 edition of the D.&C, and through the pages of that book our first encounter with the Lectures on Faith, it is also a fact that our search to discover the roots and the truth of Mormonism has taken us far beyond the pages of that single volume. It was the spark that set ablaze our desire to know the truth, but it was only the spark. While you mentioned in passing that you have somehow “come to grips” with personal concerns you apparently once had with the conflicts in doctrine between the Lectures on Faith and present day LDS theology, you fail to say what your concerns were or how you managed to resolve them. Instead you suggest that we might somehow benefit by a rereading of the Book of Mormon. I must admit, Brother Featherstone, that your suggestion seems a bit strange since the Lectures on Faith are not a part of the Book of Mormon. In addition, since the theology of God as found in the Lectures on Faith is in fact very much the same as that found in the Book of Mormon, and since these writings no longer agree with popular Mormon doctrine as to the nature and being of Deity, I’m a bit puzzled by how such a rereading of the Book of Mormon could possibly affect someone’s understanding of the Lectures on Faith in the manner you appear to suggest. However I do want to return shortly to the subject of the Book of Mormon. I agree that it is a keystone element in the religion founded by Joseph Smith, the very symbol used by the Mormon church to “prove” Joseph a prophet, and as such requires our attention. Title page from an open 1835 edition of Doctrine And Covenants (D&C). 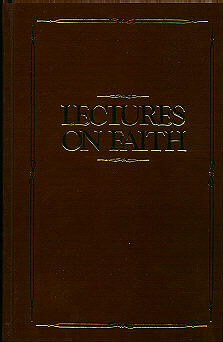 The “Lectures on Faith” comprised the “doctrine” part of D&C until it was removed starting with the 1921 edition. Deon and I desire to share with you by way of this letter something of that which we have discovered in our studies, beginning in 1978 with the reading of my grandfather’s 1903 D&C. You may find some of our conclusions difficult to deal with from a personal standpoint, but we assure you that our intent in responding thusly to your letter is motivated by feelings of love and concern such as you have expressed to us, and we invite you to consider all we have to say before drawing any conclusions. It is in exactly this manner that we have approached your letter to us, and we now pray that the Holy Spirit will employ what we write to touch your heart. It is true that I served a mission for the LDS church in Southern Brazil from late 1959 until early 1962. And it is also true that Deon and I were married in the Mesa, Arizona LDS Temple in 1963. These bare facts do not however reveal anything about our backgrounds or our experiences with life except on an extremely surface level. While I assure you that I have no intention of detailing our histories for you here and now, I believe you should know that we are two rather normal people for the most part. 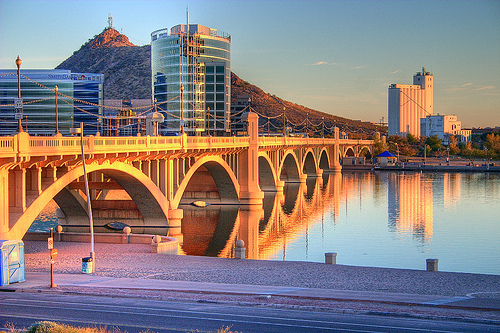 We have four children, three boys and a girl, and live in a 20 year old section of Tempe. Until some time after discovering grandfather’s old D.&.C., we maintained a rather ordinary family profile in the church. I was teaching a Blazer B class, Deon was instructing the Beehive girts, and our two older children were in the presidencies of their respective classes. At the time we finally concluded that we could no longer continue attending the Mormon church, Deon and I held current Temple recommends. To say that our decision was without doubt the most trying that we have ever gone through would be to say too little. Deon and I both were raised in the church, she by reason of multi-generation ties on both sides of her family, and I by reason of multi-generation ties on my mother’s side. 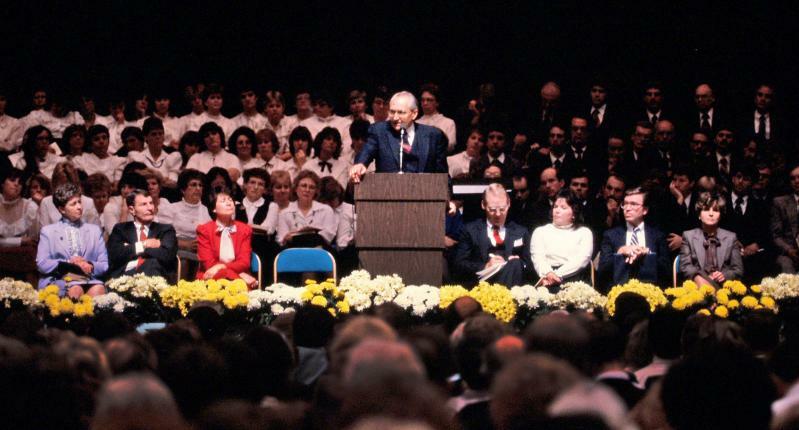 Our religious experience and training until 1978 had consisted of current surface level LDS orthodoxy, and nowhere in this training had we been prepared to deal with controversy of substance except for the admonition that we not permit ourselves to be influenced by what “others” might say. We were never told that the real danger lay not in what “others” had to say about Mormonism, but in what lay concealed just beneath the surface of present day LDS practice and belief. How we managed to stay so uninformed so long is now a puzzle to me! It seems that if people can be kept busy enough in an organization to insure that they have neither the time nor the inclination to seek to inform themselves in more depth than is “authorized” as to the true nature of the system, then control is rather easy. In our case I believe that had we failed to come across the 1903 D&C, that we would doubtless still be engaged in unquestioning local LDS doings. But I also believe that God intended that we discover the things we have about Mormonism, and that He saw to it that the circumstances of finding my grandfather’s old volume of LDS scripture were in place. I had no way of knowing it at the time, and grandfather offered no further commentary on the subject, but I had been introduced all in the same day to the crux of the controversy that would ultimately provide the spark setting ablaze our desire to learn the truth about Mormonism. Even though I had not recalled that event from the day of its occurrence until I found and read grandfather’s book, when I discovered the source of his understanding and the door to that hidden memory was keyed open, it came forth so fresh and in such undisturbed condition that it was as if grandfather revisited me at that moment in order to repeat his instruction in the truth of God in a way that I would never again have cause to doubt. In a way wonderfully impossible to express I knew at that moment that God is Spirit. 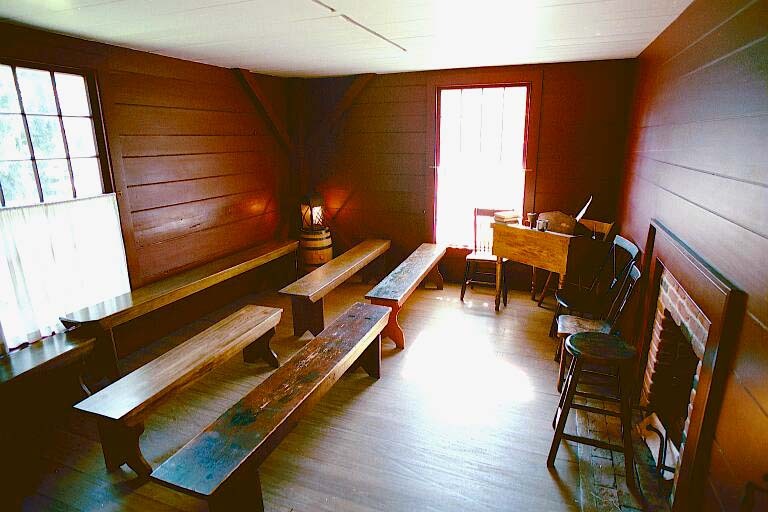 The “School of the Prophets” room in Newel K. Whitney’s Kirtland, Ohio home-based store where seven lectures by Joseph Smith were given to the students. They were later published as the “Lectures on Faith” and included in Doctrine & Covenants. Discovering the Lectures on Faith and having to deal with the questions they generated led us to approach a few people in our Ward whom we hoped might be able to help us resolve the conflict between early and later LDS doctrine as to the nature and being of God. After all, if eternal life depends upon a correct knowledge of God, allowing one to worship Him in spirit and in truth, then it was of the utmost importance that we come to grips with the problems we had inadvertently uncovered. Why had my grandfather, a Seventy and a well-respected missionary for the local church, been taught that “God is a Spirit,” if in fact Joseph Smith had learned that God is not a Spirit being but a “glorified man” many years before the Mormon church was founded? 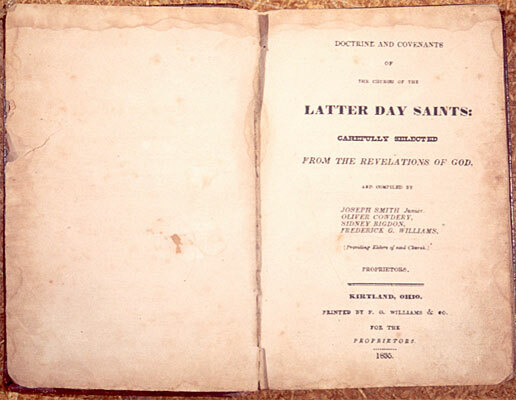 Why did the Lectures on Faith (which were employed to instruct the early LDS church in doctrine, and included in every edition of the D&C from their insertion in 1835 by vote of the conference of the church, to their removal in 1921 without a similar vote) say what they did about God if in fact Joseph Smith actually knew better years before they were first written and used to instruct in the Kirkland LDS School of the Prophets? Such questions of course must have answers, and the truth of the matter is that for many months we trusted that the church would be able to provide answers allowing us to keep intact our desire to believe Joseph Smith really did see God the Father and Jesus the Son in 1820, just as we had been taught and deeply believed as ultimate, absolute truth. In discussions with those we hoped would be able to help, we sought answers that would allow us to continue believing what we had trusted all along to be true. Nevertheless I felt that God had led me to this place, so I spent time looking over the selections. Finally settling on Jerald and Sandra Tanner’s book, “The Changing World of Mormonism,” I purchased it and left for home, prayerful that it might provide answers to those questions that our LDS contacts could not honestly deal with. After reading the book through twice in two weeks, saying little about what I was learning because I still wasn’t ready to admit to the impact it was having, I turned it over to my wife suggesting that she read it. I warned her that if she thought there were problems with the changing nature of the doctrine of God in LDS teachings, that she should “buckle her seat belt” because she was about to be utterly amazed as she discovered how little either of us really knew about problems in LDS history, practice and doctrine that face a person who decides to truly investigate. As she began to read that book, I returned to the store and bought the Tanner’s larger volume, “Mormonism – Shadow or Reality?” For the next three weeks we compared notes on things we were finding out about our church, things that on our own we never would have discovered, things that everyone should be aware of so informed choices respecting the church can be rightly made. We found for example that Joseph Smith had given a number of accounts of the “first vision” prior to dictating the “official account” of 1838, which was first published in 1842. This alone amazed us. We had been taught that Joseph had given only one account of this key event, the one found in the Pearl of Great Price. We had no idea there were other earlier accounts which differed in critical detail from the 1838 “official account.” The earliest known account, which surprisingly proved to be the only one actually written by Joseph Smith himself, was dated 1831-32, some six to seven years nearer the event in question than the so called “official account” that Joseph caused to be written in 1838. And it says nothing about him seeing God the Father! In actual fact the 1831-32 account is so dissimilar to the 1838 “official” version that one would wonder upon reading the two accounts side by side if indeed they can by any stretch of the imagination be seen as describing the same supposed event. Add to this the fact that there are yet other “first vision” accounts dictated by Joseph between 1831-32 and 1838, once again supposedly detailing this keystone Mormon event, each of which tells a story different in critical details to the others, and what do you have? The knowledge that Joseph Smith either wrote or caused to be written various versions of his supposed “first vision” between 1831 and 1838, each differing in such a manner from the others that one is hard pressed to tie them together – except in the sense that when put in order of production they show a definite evolutionary development of the story line now subscribed to in the “official account” – caused us to discredit the actuality of the 1838 “first vision” story as it is now dutifully taught as ultimate truth. These discoveries did however help us understand why the doctrine of God found in the Lectures on Faith is so contrary to current teachings, as later we studied the development of that doctrine in the early LDS church. Our immediate desire upon reading the Tanner’s books was to find answers to these things from the church’s point of view. I had almost forgotten the promise God had given on directing me to the Carpenter’s Shop, that what He was leading me to contained the answers needed. I found myself driven by my sense of loyalty to the church, and also by a growing desire, fostered I suppose out of the sense of disorientation I felt and the panic I knew to be lying just beneath the surface of our still outwardly normal approach to life and living, to “prove” that in the face of all I had now examined the church was somehow still true. Deon shared my drive in this respect, and so began our long period of growing disaffection and disillusionment with the establishment which claims to intimately care for the membership of the church. Our questions by this time were many and varied, as well as extremely detailed. We sought out some of those we had talked with when our questioning had been limited to the Lectures on Faith, as well as others we came to be aware of through our ongoing studies. Most of those we spoke with, wrote to, or telephoned admitted that what we had found was solid, factual, well documented material – and that the church had not been able to rebut the Tanner’s contentions. We still didn’t want to believe this to be true, but to that time we had avoided speaking our concerns directly to other than those we felt we could trust. We were still afraid to openly ask questions. After all, Mormons are not supposed to openly question the church, at least that’s what we thought at the time. 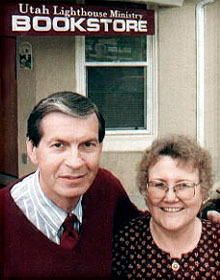 Jerald and Sandra Tanner in front of their Salt Lake City store in the 1980’s. Jerald Tanner is now deceased. After a number of such experiences we made the mistake of asking the local Mission Office for assistance with our questions. I called, explaining what we were looking for, and was told by the young man who answered the phone that they knew of “a man in Mesa” who made it his task to help people such as ourselves, people who were honestly troubled with the charges the Tanners had made about the church and who were seeking honest answers. I was almost beside myself with joy, for I actually believed their intentions were honorable and above board. For the next three weeks we waited anxiously to be called and told by Elder Simmons, our contact at the Mission Office, that my appointment with Brother Ron Brown was set. Then, quite by accident, I discovered that Brother Brown was a member of a committee headed up by Elder Mark E. Peterson, a committee whose task it is to ferret out supposed “enemies of the church” and make short shift of them. I did not in any way consider us to be enemies of the church. Instead we honestly sought answers to questions that we believed the church had to respond to intelligently if it hoped to maintain its claims in the field of religion. Nor do I now believe that we have become enemies of the Mormon people by virtue of our decision not to continue in support of what amounts to institutionalized untruth and half truth. Since when is one who seeks to make others aware of the truth called an “enemy”? I want to spend a few minutes with you Brother Featherstone, exploring an issue you raised early on in your letter. You suggested that we might do well to go back and re-read the Book of Mormon, “pray and ponder over every page”, then ask ourselves, “Could Joseph Smith possibly have written this?” As I mentioned previously, I wasn’t sure how you tied this exercise into the concerns you felt we were still dealing with regarding to the Lectures on Faith. Nevertheless I feel your suggestion is valid if you are intending by use of the word “ponder” that one engage in a carefully considered study which employs the complete mental faculty of the student. The reason I hope your suggestion, thus understood, would appeal to many both in and outside the Mormon church, is that having uncovered the truth about the Book of Mormon in the process of such a study we desire that many discover for themselves what we have come to know. 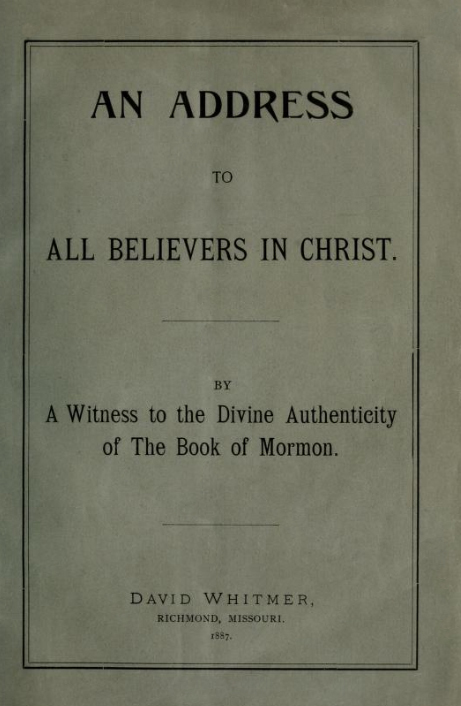 While it is obvious that our suggestion would carry little weight with persons who desperately desire to believe the Book of Mormon is all the LDS church claims it to be (for such a study will unfailingly illustrate the fact that the book is not what the church claims it to be), there is a source within Mormonism itself to whom those who doubt us may be more willing to look for guidance in such a test, someone who cannot be accused of being an “enemy” of the church. That someone is none other than the one time President of the quorum you now are a part of. Of course I speak of former President Brigham H. Roberts of the First Quorum of The Seventy. 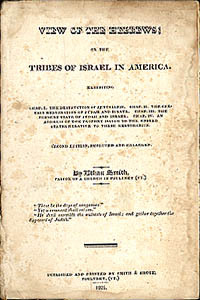 Ask yourself how someone who knows little or nothing about the realities of the pre-historic Americas, who is not familiar with the body of well developed “common knowledge” of Joseph Smith’s day respecting the native inhabitants of these continents, and who is ignorant of the fact that Ethan Smith produced two publishing’s of his “View of the Hebrews” during the eight years preceding the Book of Mormon (which publishing’s had considerable impact in Joseph’s locale, and which are shown by Brother Roberts to so closely parallel in so many suppositions and details the story line later written into the Book of Mormon), ..how anyone who is unaware of these vital background facts could possibly pick up the Book of Mormon as you suggest and “ponder” over it in the true sense of the word? And not being able to study it in a careful and considered manner for lack of the type of information that B. H. Roberts’ study would provide if they had it in hand, how do you propose that such a person can truly pray over such a critical matter?It is a shame that LDS leaders failed to make this incredibly valuable study available long ago, however it is clear they were concerned for the impact B. H. Roberts’ observations and conclusions would have on many within the church, persons who would willingly read what he had to say on the subject while continuing to faithfully avoid any such observations from outside sources. Nevertheless the fact is that with Roberts’ study in hand one is far better prepared to “ponder” whether Joseph Smith could have produced the Book of Mormon on his own. LDS doctrine holds that issues in question are to be studied out by the questioner prior to going to the Lord to seek His confirmation or denial of conclusions reached. If however the church withholds vital information that would assist in reaching a truly studied conclusion, in this case B. H. Roberts’ manuscript Book of Mormon study, how then can it pretend that the unaware person seeking to know the truth about the Book of Mormon could possibly arrive at a pondered and carefully considered conclusion over which prayer may rightly be offered? 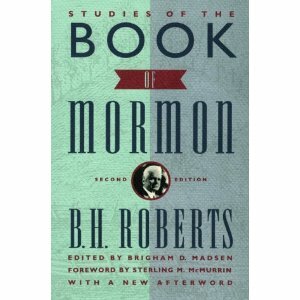 As you must certainly be aware, B. H. Roberts answered the question, “Could Joseph Smith possibly have written this (Book of Mormon)?”, in the affirmative. He said Joseph Smith could have produced the book on his own given his demonstrated native intelligence, his knack for storytelling, the access he had to the wealth of “common knowledge” surrounding the native inhabitants of these lands, and the doubtless access he had to Ethan Smith’s “View of the Hebrews,” the earlier volume that so closely parallels, in ways not attributable to mere chance, the Book of Mormon. Joseph Smith’s book is a product of the times and circumstances surrounding its production, and of Smith’s ability to utilize what he had at hand in the way of schematic materials. As such it is forever stamped a product of nineteenth century America, “Author…, Joseph Smith, Jr.,” as B. H. Roberts clearly demonstrates. “But the prophet who shall speak a word presumptuously in My name which I have not commanded him to speak, or which he shall speak in the name of other gods, that prophet shall die. How anyone, after reading the test God has laid out by which we may know of a certainty the validity of the claims of anyone who professes to speak in the name of the Lord, could then fail to apply that test to Joseph Smith in light of the claims he made is beyond me. Yet I know many who simply look the other way when confronted with God’s Word in this matter, and refuse to submit Joseph’s claims to God’s test. What did we find when we put Joseph Smith to the God’s test? We discovered first of all that he gave well over 60 prophecies “in the name of the Lord”, and that a study of these first 60 of shows that over 50 have failed to come to pass as he set them forward. Persons who have claimed far less elevated gifts of prophecy than Joseph Smith have compiled much better records of fulfillment in their predictions than he did. But that’s not the real point here. Joseph Smith claimed to be a “Prophet of God,” and in that capacity to speak “for the Lord.” The Word of God says however that just one failed prophecy issued in the name of the Lord forever brands the one who makes it a false and presumptuous prophet. God’s word declares two things about such a deceiver, first: that he “shall die” – that he shall be removed or cut off from among the people. And in point of fact Joseph Smith was cut off – killed in the very prime of his life – even though he issued prophecy immediately preceding his death in which he has the Lord promising that he will live many additional years. Secondly, God commands that we are “not to be afraid” of such a false prophet. Your letter proposes a list of 17 questions which you suggest we ask ourselves and the minister of the church we presently attend. As I have already explained, we have no intention of joining the Church of The Nazarene or any other church at this time, nevertheless I view the questions you ask as legitimate spring boards to worthwhile dialogue, and in that spirit will address myself to one or two of them at this point. Because my time is limited and the hour late, I will defer the others until another day and concentrate on what we could label “keystone issues” in any examination of Mormon claims. Your first question, “Where does the Nazarene Church pastor receive his authority?,” leads us into what may be the heart and soul of the matter from the LDS point of view. I suggest however that your question should in reality be rephrased, for the real question is, Where do the LDS get their authority? The question of authority is a favorite “hobby horse” of Mormon doctrine, and it would be of benefit to trace the LDS claim “all the way back to the beginning,” just as you have suggested. 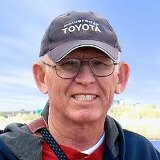 Since the doctrine of the “one true church” is part and parcel with the LDS claim to “priesthood authority,” such a review may allow us to bag two birds with one stone. In an attempt to support the doctrine of “total apostasy” the LDS church quotes such scripture as Amos 8:11-12; Isaiah. 60:2; Acts 20:29-30; Gal. 1:6-9; etc., (LDS Topical Guide to the Scriptures). However an examination of these verses finds not one which says there is to be a complete or total apostasy. In fact, some of these verses do not even refer to the church. The Bible teaches that apostasy had already begun in New Testament times, and that it would increase in the last days (see II Tim. 3 & 4). Nowhere does the Bible even infer that this apostasy would be total as Talmage and other Mormon teachers and leaders insist. Speaking of the extended history of Christ’s True Church, the Apostle Paul wrote, “Unto Him (God) be glory in the Church by Jesus Christ throughout all ages, world without end” (Eph. 3:21). Clearly Paul’s Holy Spirit inspired declaration could not prove true if the “total apostasy” for several centuries that Mormonism leans on was historic truth. Jesus spoke to the subject when He said, “Upon this Rock I will build my church; and the gates of hell shall not prevail against it” (Matt. 16:18). Paul further writes, “other foundation can no man lay than that which is laid, which is Jesus Christ” (I Cor. 3:11). Mormon scripture itself denies the very concept of “total apostasy.” In 3 Nephi 28, and D&C Section 7, we find the stories of John the Apostle and the three Nephites. These were to remain alive on the earth bringing souls to Jesus Christ until the second coming of the Lord. Even a conservative estimate of the numbers of persons such witnesses of the good news of Christ would have been able to bring to the Lord during the centuries of their ministry among men would have to be staggering to contemplate. And add to that the number converted to Christ by the testimonies of those who had been converted under the preaching of these special witnesses – well, you can see what I’m getting at. There is simply no way that the true Church of Christ, that body of believers who have been called out to Him in faith believing on His Name to salvation throughout all ages, can be said to have fallen into “total apostasy,” even from the context of Mormon scripture. 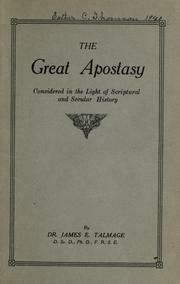 Joseph F. Smith, Jr. said the following in respect to the question of total apostasy. “As long as one Elder remains on earth today, he would have the priesthood and could organize the church even though all of the apostles and first presidency, etc., were killed off” (Latter Day Prophets Speak, p. 213). Pray tell why would this be true for the LDS Church but not for the New Testament church after which the LDS Church claims to be patterned? If we look to Mormon scripture alone we find that there remained on earth throughout the centuries at least four men who can surely be said to hold the same level of authority that an Elder in the Mormon Church claims to hold. And the commission of these men is said to be that of bringing souls to Christ until He returns (adding these souls to the true Church). So there was no “total apostasy,” and true authority has never been lost from the earth, even from the standpoint of LDS scripture — not forgetting that the Bible itself does not support such a concept. How many times I’ve asked that of others in my lifetime I simply cannot know. I am forever grateful that in Jesus Christ alone is found the true joy of the power and authority of God’s priesthood of believers, that “royal” or “holy” priesthood and spiritual house in which all those in Christ are set as “living stones” (I Peter 2:1-10). No longer do I look to other than the Lord Jesus Christ as the Rock of True Authority in my life. 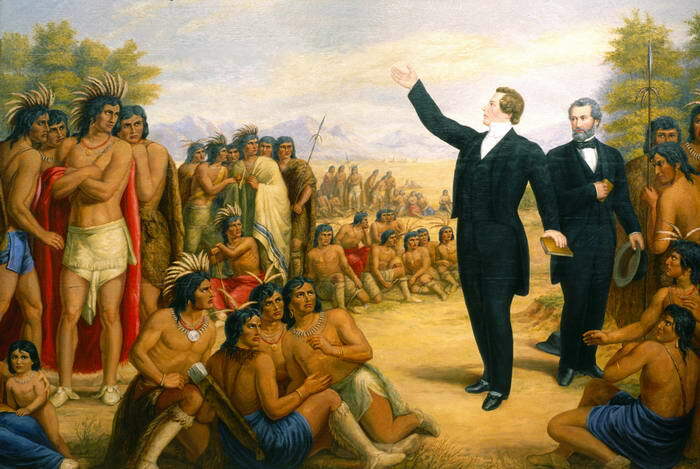 The LDS church claims that John the Baptist appeared to Joseph Smith and Oliver Cowdery, giving them the Aaronic priesthood. The Pearl of Great Price, Joseph Smith 2:68-73, says that John the Baptist appeared to Joseph and Oliver and conferred the Aaronic priesthood on them, even though they had not been baptized. 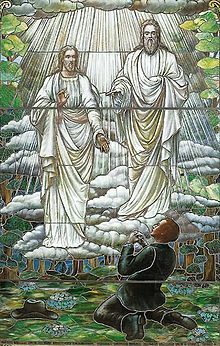 The Mormon church teaches that baptism is essential to salvation (John the Baptist’s name clearly bespeaks his mission), so why do we not see John baptizing Joseph and Oliver prior to the confirmation of the Aaronic priesthood? Surely if the Spirit of the Lord could baptize Adam (see Pearl of Great Price, Moses 6:64-65), John the Baptist could have first baptized Smith and Cowdery. The Mormon church teaches that baptism must precede the receipt of the priesthood, since baptism is said to be preceded only by faith and repentance in the life of a believer. Therefore Joseph and Oliver were not “washed of their sins” when John is said to have ordained them. Joseph and Oliver, with John the Baptist apparently only looking on, are then told to baptize one another. Strange when you think about it. These two are said to be in the presence of the one who baptized Jesus Christ, and yet they are told to baptize themselves. When they get through baptizing each other, then they “ordain” each other yet again with the same priesthood that John the Baptist is said to have already bestowed on them. I’m not trying to make light of this account, as you well know Brother Featherstone, it’s just the way it reads — I didn’t make it up. But the real questions are, is all this necessary – and did it actually happen? The basic work of the priesthood has always been that of mediator between God and men. Levitical Priests in the Old Testament were such mediators, and had to be of the tribe of Levi and of the sons of Aaron (Num. 3:6-12). Since Mormons generally claim to be of the tribe of Ephraim or Manasseh they are not qualified even by supposed lineage to hold the Levitical Priesthood. Furthermore LDS priests have never fulfilled the duties of the “priests” or the “high priests” in offering sacrifices (Ex. 29:38-44 & Heb. 5:1; 8:21). The Levitical priesthood cannot be separated from the sacrifices. Yet even if the LDS were to offer such Levitical sacrifices today, they would be of no value because the Levitical or Aaronic Priesthood was replaced or superseded in the Church by Jesus Christ, the Great Eternal High Priest. Christ is now the only Mediator (Priest) between God and men (I Tim. 2:5; Heb. 7:24-25; John 14:6). 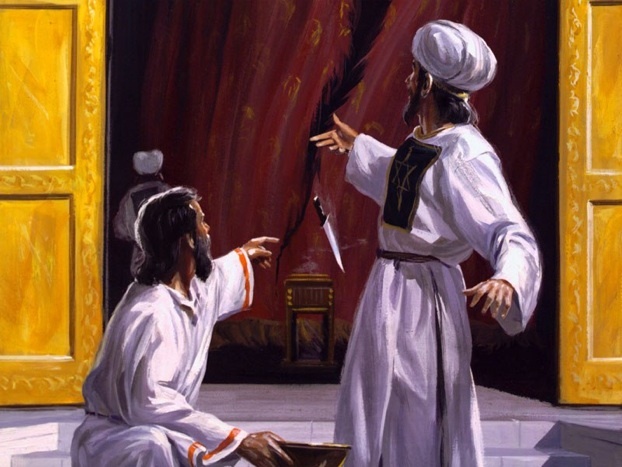 Although Aaronic priests functioned until 70 AD, when God allowed the Roman Army to destroy the Jerusalem Temple, their priesthood actually ended at the time of Christ’s crucifixion when “the veil of the temple was rent in twain from top to bottom” (Matt. 27:50-51). Apparently the Aaronic priests didn’t get the message for they patched the heavy temple curtain separating the “Most Holy Place” from the “sanctuary” (Heb. 9:2-3) and went on offering sacrifices that were only figures of what Jesus Christ had already completed (Heb. 9:1-10:21). On the other hand true followers of Christ “enter the Most Holy Place by the blood of Jesus, through the veil, that is to say, His flesh” (Heb. 10:19-20). When Jesus died on the cross, God ripped the great temple veil, which was 60 feet high, from top to bottom exposing the “Most Holy Place,” thereby declaring that through Christ’s death believers have access directly to God. In Old Testament days there was only one high priest on earth at a time. Once each year He went into the “Most Holy Place” to offer blood sacrifice for himself and for the sins of the people (Ex. 30:10; Heb. 9:7,19-22). However in the New Testament Church Jesus Christ is both the High Priest and the final sacrifice (Heb. 3:1; 9:11-12, 25-26). His body was offered once for all, and now there is no more sacrifice for sin (Heb. 7:26-27; 9:11,12,26; 10:10-14). Because that work is finished I there is no more need for a high priest on earth. Hebrews 8:1-6 says that Christ, the only High Priest, is in heaven. The Book of Hebrews repeatedly declares Jesus Christ to be the only High Priest after the order (manner) of Melchizedek. His Priesthood is declared to be “unchangeable” (literally, “untransferable” or “passeth not from one to another” Heb. 7:24). Jesus never gave this Priesthood to anyone. It was His alone on the basis of the power of an indestructible life. He is consecrated forevermore (Heb. 7:25) after the manner of Melchizedek (Heb. 7:15-17), and lives forever as the believer’s One and Only High Priest. To those who put their faith and trust in Jesus there is no need for other high priests! Mormons teach that Joseph Smith had to have the priesthood before he could establish the church. However the Bible never says that apostles, bishops, deacons, or any other New Testament office held either the Aaronic or Melchizedek priesthood. So why did Joseph Smith need it? Even the Book of Mormon is silent about the Aaronic priesthood, and it mentions the Melchizedek priesthood only once in a direct reference to the person of Melchizedek. If as Mormons claim the Book of Mormon contains “the fullness” of the everlasting gospel (D&C 20:9; 27:5; 42:12; and P. of G.P. Joseph Smith 2:34) and it doesn’t mention Aaronic or Melchizedek priesthood in the church, why insist on it now? Every believer in Christ for life and salvation possesses the “holy” or “royal” priesthood (I Peter 2:1-10). However that priesthood is neither Aaronic nor Melchizedek, and it does not exclude women and children (see Gal. 3:18; Acts 10:34; Rom. 2:11; 10:12; Eph. 6:9). The Book of Mormon, in 2 Nephi 26:33 and Jacob 2:21, declares that God sees all mankind alike, whether they are black or white, male or female, bond or free. The exclusion of Negroes prior to 1978 and the continuing exclusion of women from the LDS priesthood says plainly enough that the Mormon view of mankind is not the same as God’s view. Let’s get back to the claim of the “restoration” of the priesthood. Is it necessary to depend solely on the story told by Joseph Smith if one wants to examine the issue from the LDS viewpoint? Of course not. There are many Mormon sources from which to draw evidence weighing on the truthfulness of Joseph’s story. For example, the Mormon Church maintains mountains of records, but in these nearly countless volumes we search in vain for we find no record whatsoever of the restoration of the Melchizedek priesthood, explaining when and where Peter, James, and John were supposed to have visited Joseph Smith. D.&C, 27:12, where the visit is mentioned, is dated August 1830. Mormons use this as historical evidence. However when we go back to the Book of Commandments, where the revelation was originally published in 1833, we find Peter, James and John nowhere mentioned in these original verses. Mention of them first appears in the D&C as published in 1835. By comparing the original revelation as published in 1833 with the same revelation reprinted in 1835 we discover that 13 verses have been added, verses containing the names of Peter, James and John. This modification of the 1833 revelation, to make it appear when reprinted in 1835 that the “restoration” of the Melchizedek priesthood had been known prior to August 1830, casts a huge shadow over the scene even from the LDS standpoint. If, as Whitmer claims, the Church of Christ knew nothing about “priesthoods” for the first two years of its existence, and when it was introduced into the church it came as the brainchild of Sidney Rigdon through his influence with Joseph Smith, then we see that the Mormon claim of priesthood authority being restored prior to the founding of the LDS church is once again proven false. D&C 20, which originally was chapter 24 of the 1833 “Book of Commandments,” mentions nothing about high priests in its original form, nor did it mention high priesthood. Only when it was reprinted in the 1835 as the “Doctrine & Covenants” do we find verses 65, 66 and 67 inserted, verses that bringing the subjects of high priesthoods and high priests into the picture for the first time — with no indication of a change. 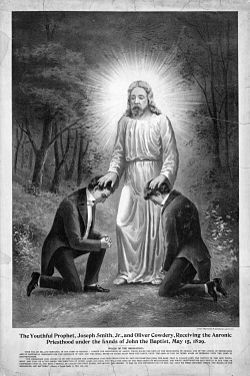 Joseph Smith himself recorded in June of 1831 that “the authority of the Melchizedek priesthood was manifested and conferred for the first time upon several of the elders” (D.H.C. vol. 1, pp. 175,176). In the Journal of Discourses, vol. 11, page 4, we learn that Ezra Booth, a Methodist minister, was present when the elders first received the High Priesthood in June, 1831. This is more than a year too late to support LDS claims since the Church of Christ was founded in April, 1830. Had Rigdon and Smith left well enough alone they would have been alright as far as history would have been concerned. After all they had a perfect right to call authority in their church “priesthood” if they wanted to. But by going back and changing the revelations in the 1833 Book of Commandments to make it appear, in 1835 when the D&C was first published, that their “priesthood restoration” had been accomplished prior to the 1830 founding of the church, they carried the ball a bit too far out of bounds, becoming their own worst witnesses in this whole matter. Brother Featherstone, you say that you are a “special witness” that “Joseph Smith’s testimony is true.” You also declare that you bear a “sacred testimony” to this effect and would “do so with (your) life..” Believe me when I tell you that I know you are sincere in your testimony, and I do not in the least question your sincerity when I point out that sincerity has never been the final test of the truth or untruth a question. We can all name many “sincere” people that history records as being in the wrong. In evaluating a subject as complex as Mormonism, we would do well to remember that the plumb line of the Word of God is in place to assure believers that our feet are planted on the Foundation Rock which is Jesus Christ. There is only one Lord and Savior, while there are many pretenders. My special witness to you and to the world, Brother Featherstone, is that Jesus Christ alone is Savior and Lord, and I’ve come to know Him as I never did before, through the witness of God’s word and the testimony of the Holy Spirit of Truth. Opening my heart to the saving Truth of God’s word, I ask Christ into my life as Savior and Lord. Just as promised He came to dwell in me by God’s Holy Spirit, and has remained with me from that moment on. Although my prayer was far from eloquent Christ knew my heart and touched me with the assurance of His holy presence. I experienced the perfect love and healing power of Jesus Christ in the deepest possible sense, with various “thorns in the flesh” that brought torment prior to coming to Christ swept aside as God’s Holy Spirit did His work in my life. I praise the Lord Jesus with all my heart and soul for His ongoing work in and through me. That I may be of service in leading hearts and souls to Him is my desire. Early on in your letter you suggested, “Though argument does not change belief, the lack of it destroys belief.” Deon and I agree, and in that spirit we invite you to correspond further as you see fit. Even if you decide not to do so we want to say a sincere thank you for your evident caring heart, and prayerfully invite the Holy Spirit of God to touch you deeply and in a most unexpected way as you ponder and pray over His Biblical Word of Saving Truth. To this greatest of all Truths I bear sacred testimony. During the summer of 1982 my wife and I received the following unsolicited letter from Vaughn J. Featherstone, a member of the LDS First Quorum of the Seventy in Salt Lake City. In his letter Featherstone questioned us closely about a report he had received, apparently from a third party, expressing concern for our ongoing investigation of Mormon claims. I will post our reply to Mr. Featherstone’s letter as Part Two. Your decision to leave the “Mormon” Church and join another Christian church has come to my attention. Someone has said, “Though argument does not change belief, the lack of it destroys belief.” I understand that the removal of the Lectures on Faith from the Doctrine and Covenants was your major concern. Let me raise some questions, in love, that you should ask yourself before making this choice that has eternal consequences. Possibly you would want to be as thorough in your investigation of a new found “faith” as you were in your study that led you out of the Church. It is my understanding, Brother Rasmussen, that you served a mission for the Church and that you were married in the temple. Lest what I write next seem too simplistic, please continue on. Your concern over the Lectures on Faith is one I have personally come to grips with. Those faced with such concerns have used the principle in Book of Mormon, Key to Conversion. That is, go back and again read the Book of Mormon, pray and ponder over every page, then ask, “Could Joseph Smith possibly have written this?” I am a special witness that Joseph Smith’s testimony is true. I bear a sacred testimony and would do so with my life, if necessary, that he was a prophet and that the Book of Mormon is true. 1. 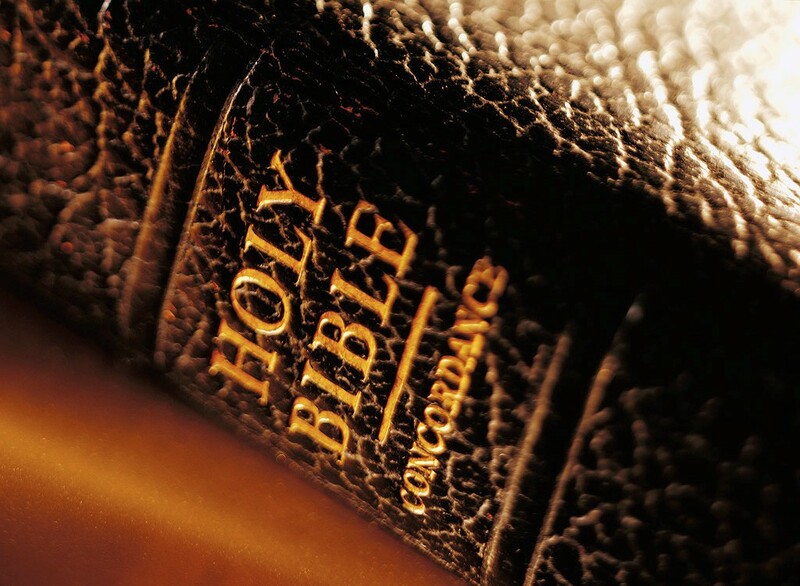 Where does the Nazarene Church pastor receive his authority? Trace it all the way back to the beginning. Your normal thoroughness would dictate this. 2. Have the pastor explain and teach you the church’s concept of God, the Eternal Father, and His Son, Jesus Christ. Have them teach you their concept of the Holy Ghost. 3. Ask your minister about the doctrine of the Nazarene Church regarding the myriads of souls who lived in ages past that have died without ever hearing of the Nazarene Church, or even of Christ. Have him explain the interpretation of the scripture, “Else what shall they do which are baptized for the dead if the dead rise not at all?” Does this church practice baptism for the dead? Only one Church that I know of does and you understand why (I Corinthians 15). Ask your minister to explain the three degrees of glory talked about by Paul, again in I Corinthians 15. 4. Ask him if he would continue to be a pastor in the church if his salary were discontinued. As you know, we do not have a paid ministry. 5. Have the minister explain the term Melchizedek as mentioned in Hebrews 7:1-6, Hebrews 5:6,10, etc., etc. 6. Ask the minister if he pays a tithing. As you know, our stake presidents, bishops, and General Authorities do. Are the people in the church tithed? 7. What is his interpretation of Isaiah 58:6-9? Does his church have a fast and an offering? 8. You understand the Bible. In Ephesians 4:11-13, we are to have apostles and prophets in the Church till we all come in the unity of the faith. This has not happened yet. Also, all the other officers including evangelists (patriarchs). 10. Ask the minister if his church has “sealing” powers as mentioned in the 16th chapter of Matthew. I testify to you, in the name of Christ, that there is no other church on the earth that has sealing powers that can seal a man and woman together for time and all eternity. 11. Does the Nazarene Church have a missionary program to every nation, kindred, tongue, and people? It should if it is the only true and living church of Christ on the earth. (See Matthew 25 the last few verses). 12. What does Malachi mean by “turning the hearts of the fathers to their children and the hearts of the children to their fathers?” You know but the minister doesn’t. Over the years you have been taught the hidden treasures of knowledge-the Word of Wisdom, sealing powers, the plan of salvation, genealogy and temple work, etc. etc. These things are common to you, but not so with the minister. 13. Show me another church that even approaches the Church of Jesus Christ of Latter-day Saints’ welfare program. You know that we teach self reliance, thrift, and independence. 14. Ask him about temples in his church and what takes place there. Ask him to tell you about the “coat of skins” that clothed Adam and Eve. 15. Ask him to explain where his church received the baptismal prayer, the sacramental prayers, and determine how shallow or deep his understanding is of the sacrament. 16. What mode of baptism is used? “Buried with him in baptism,” as in Colossians 2:12? You know, but the minister does not. Isaiah 29:4 & 11-14 The Angel Moroni delivering the Book of Mormon. Now, I could go on and on taking scriptures from the Bible that you both understand but the ministers do not. You have had the Pearl of Great Price all along. Don’t sell five generations of a birthright for a mess of pottage. Look into your souls. Have you faithfully lived the Word of Wisdom? Have you faithfully paid your tithing? Were you regularly attending meetings in the Mormon Church? Is your life free from transgression? Are you pure in your thinking? Were you faithfully holding quality family home evenings, family prayer, and personal prayers. Were you keeping every covenant you made in the temple? Only you can look deep in your hearts and make certain that there is not a “real” reason other than the “reason given” for leaving the Church. President Heber J. Grant said, “If you get on a hobbyhorse it will ride you right out of the Church.” It doesn’t matter whether it is the Lectures on Faith, the Word of Wisdom, the Equal Rights Amendment, or any other hobby. My friends, think back on the Book of Mormon. I can’t imagine what my life would be like without Nephi, Jacob, King Benjamin, Ammon, Alma, Samuel, Mormon, and Moroni. These and all the other prophets in the Book of Mormon were some of the greatest prophets who ever lived. What a tragedy it would be to remove the prophets and teachings of the Book of Mormon, the Doctrine and Covenants, and the Pearl of Great Price from my life or from yours. I know that these prophets lived and that the Book of Mormon is true. It is my opinion, learning of your story, that your experiences with your faith in Christ are valid. No church on the earth believes in Christ, the literal, physical Son of God like the Church of Jesus Christ of Latter-day Saints. We know he was sired by God, our Heavenly Father, and that Mary was his mother. Under separate cover, I am sending you a copy of a book I have written, Charity Never Faileth. Perhaps it will share with you my love and tender feelings for the Church. I remember hearing the story of a bishop who was released after six years of service. He felt lonely and unneeded. He said that Satan tempted him, saying, “Read the Doctrine and Covenants and I will prove to you that it is not true.” He said that Satan took him through the Doctrine and Covenants, page by page, and raised every question he could. When the bishop laid down the Doctrine and Covenants, he said his testimony hung in the balance and he was no longer absolutely certain that it was true. 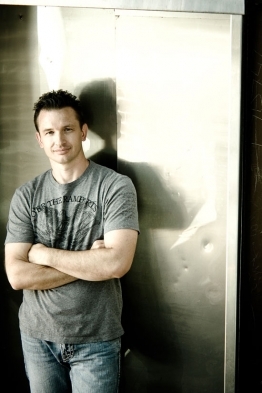 He knelt down in prayer and pled with the Lord to help him know whether or not it was true. He said, “I pled like I never had before in my life. Then I went back and read again the Doctrine and Covenants, only this time the Savior took me through it. Every page confirmed that it was divinely inspired and I had regained my testimony.” Then the Lord revealed to this bishop that a change was being made in the stake and he would be the new stake president. 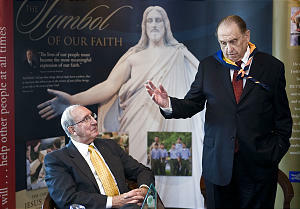 A few weeks later he was called as stake president. Please, my wonderful Latter-day Saint friends, this is a test. Do not fail. All eternity is hanging in the balance. I am sending a copy of this letter to your stake president so that someone can visit you and be available to respond to whatever questions you may have.